An ethylene refrigeration compressor in ethane cracker unit is powered by surface condensing steam turbine that operates under vacuum. The vacuum is sustained by inter and after condenser. The condenser utilizes two steam ejectors a primary and secondary to pull a vacuum. Ejectors and inter-after condenser units constitute a critical part of stable turbine and surface condenser operation. Constant and sustainable vacuum is crucial for turbine and compressors they power. The 15 year old inter-after condenser had to be taken offline due to performance issues. The condenser suffered from two main problems: one it was unable to maintain design vacuum for the turbineâs exhaust at no load condition; second the vacuum under load was not stable to the point that it would slowly deteriorate over time reaching turbine's trip point. An auxiliary âhoggerâ ejector had to be utilized to provide necessary vacuum by plant operation. The âhoggerâ ejector exhausts steam to atmosphere without condensing it. 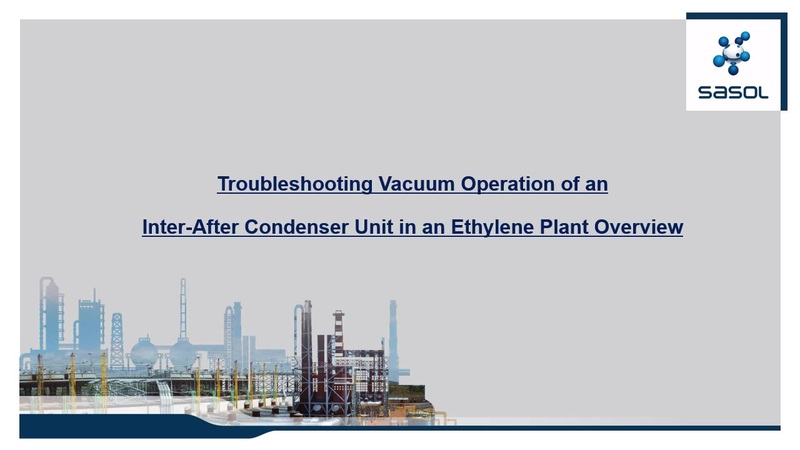 A rigorous troubleshooting study was initiated to bring online the condensing unit along with primary and secondary ejectors in order to save on steam usage and eliminate the noise level caused by the hogger jet. The paper focuses on design, principle of operation, troubleshooting and observations of single inter-after condenser unit along with its steam ejectors and surface condenser it services. Understanding of surface condensing units along with steam ejectors spans industries and lessons learned tend to be the same across. The study was formulated to systematically evaluate each piece of equipment in the condensing unit. Preliminary inspection has shown no tubes leaks between the shell and cooling water tubes or erosion in the ejectors. During tests further inspection revealed steam traps that were not properly specified, isolation bypass valve that had a leak and low compression ratio at the secondary ejector which was leading to higher back pressure causing further low compression ratio at the primary ejector. Secondary ejector had a degraded diffuser and loose steam nozzle where portion of the steam bypassed the nozzle and contributed further to overloading of the ejector. Another trial was conducted to test for internal condenser baffle leak. To test for suspected baffle leak between inter and after areas of the condenser, secondary ejector was unloaded and exhaust direct to atmosphere rather than to after condenser. Process data was collected along with each trail. After tests and data collection, unit was brought online with modified thermostatic vents on steam traps, bypass valves isolated and secondary ejector nozzle replaced. Turbine's surface condensing unit achieved stable vacuum operation range of 61-89 mmHgA vs. 125 mmHgA (original and unstable vacuum pressure with slow further deterioration prior to this troubleshooting study) under full plant load. The suction pressure to the secondary ejector decreased by a significant 114 mmHg. The troubleshooting study showed that inter after condenser was suffering from multiple bottlenecks that acted simultaneously to the detriment of the system performance. This paper originally appeared in special focus section of Hydrocarbon Processing August 2017th issue and the paper is modified to fit EPC purposes.